Regular water testing is one of the cornerstones of aquarium success. The Aqua One Quick Drop test kits are both simple and economical to use. Each kit should last a full year of regular use. Buy the full range from the Aqua One experts with our usual fast dispatch and low cost delivery. Choose your Aqua One Quick Drop Test Kits from our extensive range below. We have a huge range of freshwater and marine test kits to cover all aspects of water quality. Need help or advice? Just give us a call... we are here to help. 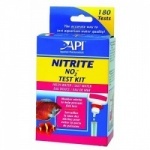 Monitor your aquarium nitrate level with this easy to use test kit from API. Tests from zero to high levels. Monitor your aquarium nitrite level with this easy to use test kit from API. Tests from zero to high levels. Trying to run an aquarium without monitoring your water quality is like trying to drive without a steering wheel - it just isn't going to work for very long!If you keep tropical fish then weekly tests should be carried out for PH, Nitrite, Nitrate and Ammonia. For Marine set ups Phosphate, Calcium and Carbonate Hardness may be added to the list. The Aqua One Quickdrop Range of test kits are easy to use and very economical when compared to other brands. They have been extensively market tested on tens of thousands of Australian Aquariums so you can be sure of excellent results for your set up. Test results can be a little confusing at first so if you need help interpreting them or on deciding what to do next then please do get in touch - don't forget that we are the UK's foremost experts in everything Aqua One.